Rob and Rachel Badman are songwriters and worship leaders from the Blue Mountains who seek to lead people into an encounter with God’s Presence through their creative and powerful music. This is a powerful and comforting congregational worship song, along the lines of Matt Redman/Tim Hughes with a bit of Coldplay thrown in towards the end. The chorus lyrics are re-appropriated from a 116 year old hymn by blind African-American composer Fanny Crosby. Ramos Jakob, which some of you may recognize as Ramos D-Artist, is a singer/songwriters/set designer/producer. Music is an explosive expression of our humanity. It gives us a space to grow and celebrate our diversity so we can give and receive such beautiful things as joy, dignity, acceptance and healing.﻿ The single is a celebration of exactly this. Future Destin is a playwright, Gospel artist a speaker. He released his first ten pieces EP "Power of Three, Trinity" in 2013. Now release his second EP called Kingdom First. Living for the Kingdom is a single release from the EP "Kingdom First." Ivana’s songs are a reflection of her personal encounter with Jesus Christ, the revelation of His unconditional love, the desire to know Him more, and to bring glory to Him. For You Are God is a song that brings joy, excitement and praise. It is the type of song that one loves to listen to in the car when one is feeling down giving honour and glory to who God is regardless of the circumstances they may be challenged by. A singer/song writer in the acoustic folk tradition. Intimate and personal songs of worship and devotion, reveal an authenticity and vulnerabity in the wrestle with this life. An up tempo song- a declaration of praise to God. He is our king of kings worthy of praise, exalted high and lifted up. Melisa Ferreira's songs are inspired by the Holy Spirit and encourages people to stay strong in their daily walk with God despite the hardships we all face in life. Like A Warrior encourages people to never give up in the tough times. It further encourages listeners to never give up hope because God has a good plan and future for us all despite the storms we face. God fights our battles, we are only to trust Him (Exodus 14:14). Andi Hillman is a singer/songwriter from Melbourne who loves creating music that inspires people to connect with God. With a fresh, reflective rock sound, and powerful lyrics. 'Awake My Soul' is a catchy rock/pop anthem that leaves the listener uplifted & inspired. The memorable chorus melody provides the listener with a powerful prayer to God inviting Him to come and bring a sense of awakening & renewal. Definitely a hit song from start to finish! Look To The Mountains have set 3000 year old scriptures to modern alternative music. The Psalms are reborn with melodic musical and vocal hooks and powerful passionately sung harmonies. Spaghetti western guitars and soaring harmonies take this epic story of ancient Israel to the heart of the American west. From the alt-blues/grunge power of Soundgarden to the experimental sounds of Radiohead’s “OK Computer” plus a healthy appreciation for the vocal stylings of Jeff Buckley, Luke Garfield finds his roots. Out of the gates this song has energy by way of a four-to-the-floor driving beat. Choruses have nice lift. The bridge climaxes and even includes a jet fly by sample tucked in there to add to the tension/release. Vocal performance is raw and emotive. Even Greater have a great mix of Christian rock with a beautifully spirit lead ministry style of writing. Featuring singer songwriter Nathan Fawcett 2 tracks. Hip Hop Soul, Charismatic, Christian artist with Cross over potential. James lyrics are inspirational and thought provoking. The Hopes and Dreams track fuses a hip hop and acoustic pop flavor held together by lyrics that touch the soul. In this 3min dose of hope power packed track, James hopes you will be inspired to look at your life in a positive, different way. The song is a devotion to the Sacred Heart of Jesus, I guess some call it the flaming heart... in any case it is a song that represents Jesus Christ's physical heart as the representation of His divine love for humanity. Can You Feel The Fire? With multiple International Songwriting Awards and numerous number one charting singles, Paul and Will have come together to write and perform songs they hope will lead people closer to God. The first single ‘Your Love’ was penned by Paul Cowderoy and is what the guys term ‘Alt Worship’. A style they hope will become synonymous with the raw worship style they enjoy writing and leading. Just your average 18yo Christian Aussie redhead ninja who has a strong desire to encourage others of Jesus' love and life with Electronic Dance Music. I wrote this song to help encourage others that God is there & wants to have a relationship with you as your heavenly Father. You truly are never alone, even if you can't feel His presence in the moment. You just have to call on Him, and He WILL answer! Drawing on real life inspiration, two-time Golden Guitar Winner Dianna Corcoran is one of Australian country music's most distinguished vocal and songwriting talents. 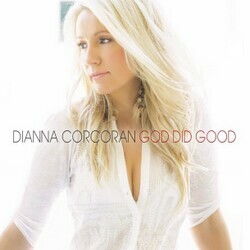 The upbeat love song “God Did Good” was written by Dianna Corcoran, Kristian Bush and Jeff Cohen and produced by Dianna Corcoran at Ocean Way, Warner and Fool On The Hill Studios in Nashville Tennessee. Ian Burns is a traditional country singer-songwriter from the Macarthur NSW district who released his debut EP Good Friends in January 2015.